The successes of AMSOIL Super Team TORC Series drivers Scott Douglas and Mike Oberg provide invaluable exposure for AMSOIL on the track, but their popularity has also translated into valuable exposure off the traditional off-road track. Traxxas offers fans of all ages the chance to drive their own Scott Douglas/ Mike Oberg Edition radio-controlled (R/C) off-road racing trucks. The trucks are available in five different models, all complete with officially licensed AMSOIL Scott Douglas and Mike Oberg bodywork: the 1:10 scale electronicpowered 2WD Slash, 2WD Slash VXL and 4×4 Slash VXL; the 1:16 scale electronic-powered 4×4 Slash VXL and the fuel-burning two-stroke Slayer Pro 4×4. Outfitted with technology straight from the world of off-road competition, all five trucks provide authentic handling dynamics that allow them to behave just like their full-size counterparts. The Slash VXL models are powered by state-of-the-art Velineon brushless electric motors, while the Slayer Pro 4×4 model features the high-revving twostroke TRX 3.3 racing engine. Outfitted with 2.4 GHz radio systems, top speeds range from 30 to 50+ mph. The trucks can be seen in R/C competitions throughout the TORC season as Traxxas provides a full R/C racing program at every stop of the TORC Series, complete with professional announcing, electronic lap counting and national-caliber racetracks. AMSOIL Scott Douglas/Mike Oberg R/C trucks are available at hobby stores across the nation (a store locator is available at traxxas.com), or they may be purchased directly from Traxxas at buytraxxas.com. Traxxas customer support is available at 888-TRAXXAS. The AMSOIL Shock Therapy monster truck and driver Jon Zimmer provide valuable brand exposure at monster truck shows across the nation, and now fans can pick up both R/C and Hot Wheels replicas of their favorite truck. The 1:10 scale solid-axle Shock Therapy R/C monster truck was developed by Crawford Performance Engineering and is built to almost exactly replicate the actual Shock Therapy truck, featuring front and rear steering, four link bars and aluminum chassis and parts. 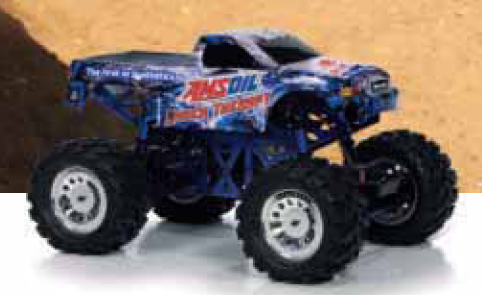 Also available in a smaller Sumo version, AMSOIL Shock Therapy R/C monster trucks are available at RedCat Racing R/C dealers, redcatracing.com, suddenimpact. com and several other online stores. AMSOIL Shock Therapy R/C truck wraps are also available through Sudden Impact, allowing fans to convert any R/C vehicle into an AMSOIL Shock Therapy monster truck. AMSOIL Shock Therapy Hot Wheels vehicles are currently available at many stores that carry Mattel Hot Wheels products, including Target, K-Mart and Wal-Mart. The trucks are available in the standard 1:64 scale and several other sizes. Dealer Geoffrey Aitchison of New Tecumseth, Ontario, Canada passed his 1985 Jetta Turbo Diesel to his daughter, Marianne, when she graduated from high school. Aitchison became a Dealer in 1982, so he installed AMSOIL products in the Jetta when he first bought it. Aitchison updated AMSOIL products in the vehicle as they became available. Initially, he installed AMSOIL 15W-40 Synthetic Diesel & Marine Oil (AME) in the engine and 75W-90 gear lube in the transmission. He changed to AMSOIL 75W-90 Long Life Synthetic Gear Lube (FGR) when it became available. The oil filter was an ASF-15, changed twice a year, along with an old-style canister by-pass system. An AMSOIL wet-type air filter was fitted. Diesel Modifier was used continuously, along with Cetane Boost (ACB) when it became available. The old by-pass system was changed to a BF-90 when it became available. Throughout its lifetime, the car had approximately 20 oil changes. 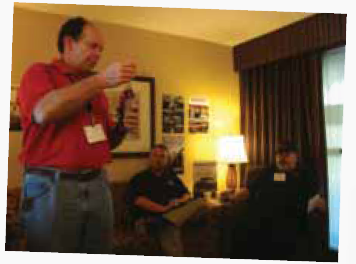 “AMSOIL is incredible, and even after being a Dealer for almost 29 years, the products still amaze me,” Aitchison said. 2000 Ford Explorer that uses AMSOIL products bumper-to-bumper. 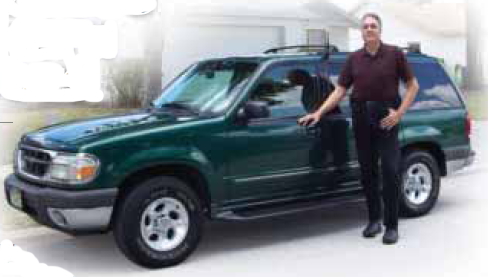 Dealer Russell Sanderlin Sr. of Orlando, Fla. attributes the high mileage on his 2000 Ford Explorer to the performance qualities of AMSOIL products. In fact, the truck turned over to 570,000 miles in March 2011. He typically travels about 65,000 miles a year. 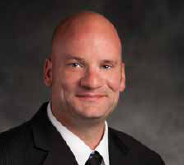 Sanderlin has had nothing but success with AMSOIL products. “I got my Explorer new and have used AMSOIL from day one,” he said. In 2000, he started with AMSOIL Synthetic 10W-30 in the crankcase, then switched to Signature Series 0W-30 Synthetic Motor Oil (SSO). Sanderlin uses AMSOIL Automatic Transmission Fluid (ATF) in the transmission and power steering. “They both operate like new and are repair-free,” he said. In the differential, he uses AMSOIL Synthetic 75W-90 Long Life Gear Oil (FGR). “I just had the fluid replaced in the differential after 500,000 miles, and my mechanic could not believe there was zero play, as if the differential had been assembled by the manufacturer the day before,” Sanderlin said. Sanderlin also uses AMSOIL Synthetic DOT-3 Brake Fluid.